February is the month when this nation celebrates the history of Black America, and what better way to celebrate than with the legacy of the Black Church and gospel music. The 20th Annual Gospel Heritage Praise & Worship Conference returns to Atlanta, February 20-22, 2014, for a three-day gathering of thousands. The entire event will be held at the Changing A Generation Full Gospel Baptist Church, where the host pastor is Bishop Paul S. Morton, Sr.
After calling together Gospel artists, songwriters, musicians and pastors to celebrate the Gospel heritage and perpetuate its legacy for the past 19 years, Dr. Hairston is declaring that it’s time for change. Hairston, 57, is the founder and president of the Gospel Heritage Foundation. She is a leader, trailblazer and trendsetter in the Gospel idiom. In 1989, she founded Gospel Today, a magazine that became the most widely distributed publication in the history of the Gospel genre. She has hosted and produced Gospel celebrations at the White House and across the world. On Thursday, Feb 20, Gospel Heritage will sponsor a “Night of Unity” concert featuring colleges and young people! Hairston declared “Worship breaks racial and denominational barriers. We are continuing to reach out and invite every nationality to join in with this worship celebration.” Rev. Dr. Martin Luther King Jr. famously declared at the National Cathedral in Washington, DC, in 1968 during his last Sunday sermon, “We must face the sad fact that at 11 o’clock on Sunday morning when we stand to sing ‘In Christ there is no East or West,’ we stand in the most segregated hour of America.” Gospel Heritage is facing that fact. Gospel Heritage’s goal is to “transform nations and generations through worship.” At the February 20-22 event, Hairston will host several presenters who echo this new movement that is changing the Church’s worship culture. Among the presenters will be: Bishop Paul S. Morton, Sr. (host, pastor of Changing A Generation Church and 2014 Grammy Award nominee); Dr. Creflo A. Dollar (keynote speaker, pastor of World Changers Ministries, Atlanta, GA) and more. The Gospel Heritage Conference is noted for incredible top-flight Gospel music celebrations. 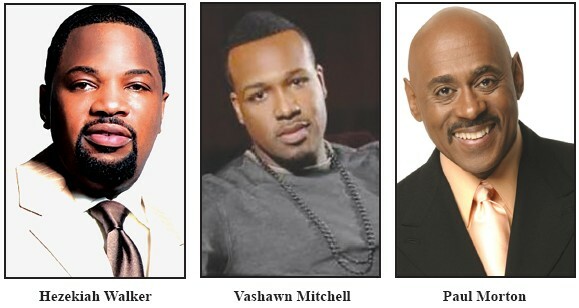 This year’s conference will host Grammy and Stellar-Award winning artists: Earnest Pugh (Rain on Us and I Need Your Glory), Vashawn Mitchell (Nobody Greater), William McDowell (I Give Myself Away), Judy McAllister (In His Presence), Richard Smallwood (Total Praise and I Love The Lord), Kurt Carr (For Every Mountain), and Hezekiah Walker (I Need You to Survive, Grateful, and What a Mighty God We Serve). Gospel Heritage offers a strong educational component which attracts thousands of pastors and creative arts leaders each year. For more information/schedule: gospelheritage@aol.com or gospelheritage.org or call 770.866.2427.